The Haunted Walk has been operating in Kingston for 20 years. That’s a long time! They have been so successful they now do tours in Ottawa and Toronto, as well as Upper Canada Village, and other special locations. There’s even a tour during the Fort Fright season, and a Seance at Black Creek Pioneer Village! I have had the pleasure of taking Emma on two different tours over the last 2 summers (the original Haunted Walk, and the Time Travel Trail Tour – both in downtown Kingston), this year I brought my husband to the late night tour at Fort Henry: Ghosts of the Fort. These tours start at 9pm, and that’s too late for my kiddos right now. 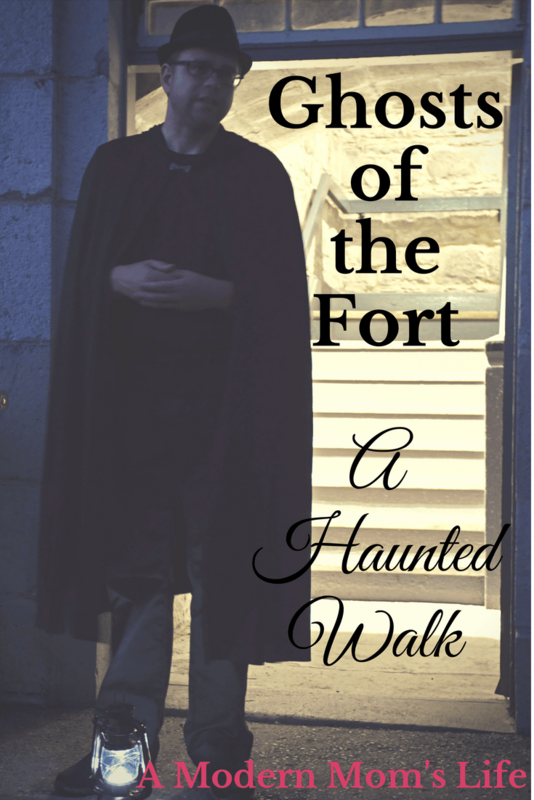 Like all Haunted Walks, Ghosts of the Fort is led by a cloaked, lantern carrying storyteller. We gathered in the upper battery of Fort Henry and were checked in. As an evening tour there is lots of dim lighting to add atmosphere to the spooky stories. But in the interest of safety we all were provided with our own mini flashlight – though we had to give them back at the end of the tour. The tour runs 90 minutes in length, and like all haunted walks is a walk, then stop and listen tour. The nice thing about the Fort is that some of rooms have seating so you can rest and listen – and it gave me some opportunities to play with the low light features of my camera. Fort Henry has many rooms and exhibits to visit – the Ghosts of the Fort tour does take you through a small selection of what’s available to tour during the day. Unfortunately there was some construction happening on the ramparts, so we weren’t able to visit the top of the fort on our tour. We did, however, visit the tunnels underneath. While they are fully lit, there is a creepiness about them whenever you visit! Our guide for the evening was Graham, and he was great. His delivery of the stories was appropriate. I know that doesn’t sound exciting, but he had great metering and expression in his voice and manner. His pauses were properly dramatic, but he was still real, and happy to chat with the group between stories. I was thoroughly captivated. My favourite part of these tours is the realism they create with their stories. Each story is researched and corroborated by evidence and supporting history. It’s fun to hear about things that happened in your town way back in 1867 when the fort was in use. The tours also share a lot of stories of hauntings that have happened in previous years (and sometimes days or weeks) of the tours operating in this location. If you are interested in the history of The Haunted Walk. I’d recommend reading my first review, when we took the downtown “original” tour. I wrote a little more about the company and their roots in The Haunted Walk – Our Review. 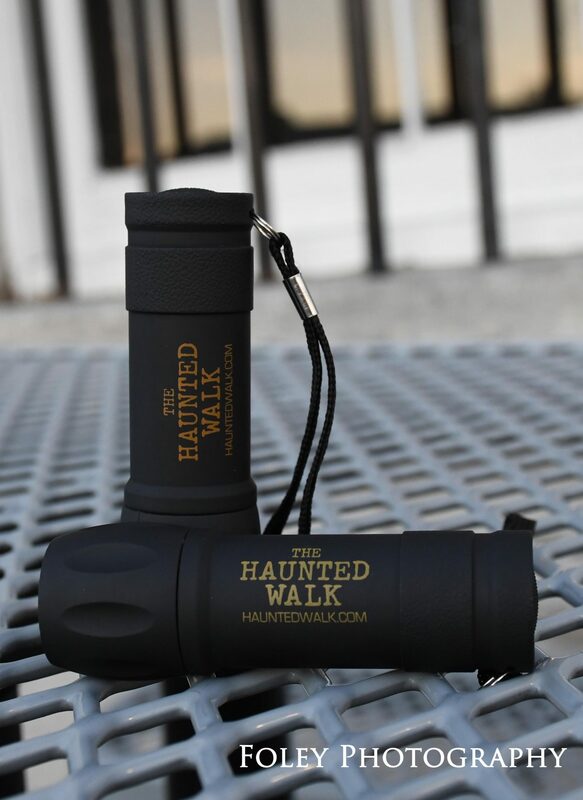 This post was sponsored by The Haunted Walk – and I thank them immensely for giving me the opportunity to enjoy these tours. Fort Henry, while not a sponsor of this post, is also an amazing place to visit in Kingston, Ontario. The National Historic site is open daily until 5pm in the summer season, except Wednesdays when they are open until 10pm for their beautiful Sunset Ceremony. I would highly recommend a visit for the sights and sounds of Fort Henry, and then stick around into the evening to be spooked on the Ghosts of the Fort tour! If you enjoyed this review I have an entire review section on my blog. If you’d like me to review and/or photograph your business, event or attraction take a look at my Work With Me page or contact me to discuss opportunities. Thanks! This sounds like my ideal date night! I would love to go on this. Ghosts and pretty much anything supernatural really interests me. I really love these tours. Any guided tours are fun for me – add the spooky factor and I’m hooked!